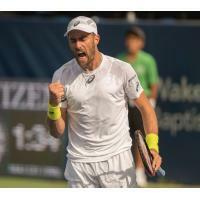 INDIAN WELLS, CALIF. - After a sub-par season by the franchise's typically high standards, the Orange County Breakers made a huge splash during the 2019 WTT Free Agency period and the WTT Draft. "Before the WTT Draft, we were very fortunate to lock in Victoria Azarenka and Steve Johnson," said Breakers head coach Rick Leach. "Vika is one of the top players in the world and Stevie is so incredible in the WTT format. It put us in a great position entering today's draft." Azarenka, a former world No. 1 and two time Grand Slam singles champion, will make her Breakers debut on July 20 in Orange County. The Belarusian has 20 career WTA singles titles and 7 WTA doubles titles to her name. Johnson is returning for his fourth season with the Breakers and will feature in three home matches in Orange County from July 22-24. The Orange County native has reached a career high ATP ranking of world No. 21 and has won four ATP singles titles in his pro career. However, the Breakers didn't stop there. Once the WTT Draft kicked off, the 2017 WTT Champions seemed to get stronger as each round went by. "We are thrilled with our selections from today's WTT Draft," said Breakers general manager Allen Hardison. "Nicole Gibbs is a Breakers fan favorite and the 2016 WTT MVP, James Ward is a Davis Cup Champion and Luke Bambridge is rapidly becoming one of the best doubles players in the world at the young age of 24. These players really solidify our 2019 roster alongside our protected player Andreja Klepac." Returning for her fifth straight season with the franchise, Gibbs was selected in the 1st Round of the WTT Draft with the second overall pick. The former Stanford All-American hit a career high WTA singles ranking of world No. 68 and reached the quarterfinals of the BNP Paribas Open in 2016. Ward was selected in the 2nd Round of the WTT Draft with the 10th overall pick by Orange County. Ward helped secure the Davis Cup title for Great Britain in 2015 and holds a career high ATP singles ranking of world No. 89. After a 2018 trade helped the Breakers secure an additional 2nd round pick in the 2019 WTT Draft, Orange County cashed in by selecting current world No. 44 doubles player Luke Bambridge. The Nottingham, England resident will be making his WTT debut this July. The upcoming 2019 WTT regular season is set to take place July 14-31 with the WTT Semifinals and Finals weekend scheduled for August 2-3. Season tickets are currently on-sale now and can be purchased by calling (949) 434-4560. For more information on the 2019 team, schedule, ticket info and more, please visit www.BreakersTennis.com.